Like the Roaring Twenties of a century ago, the real estate bull market of the last ten years crashed in dramatic style in late 2008. 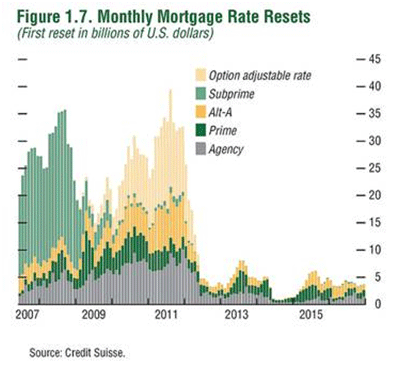 The collapse of the residential market was led by massive defaults in ill-conceived “sub-prime loans”. Millions of American homes are now in default and in the process of loan modification, abandonment or foreclosure. There is no end in sight as Prime, Alt-A, and Option ARM loan resets come due beginning in 2010. Lurking around the corner, literally unnoticed by the average American worried about keeping his home, is a similar crisis in commercial real estate. 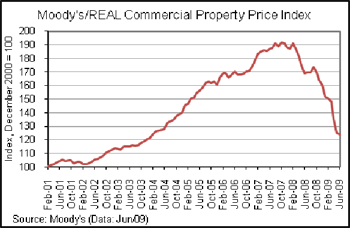 For over a year commercial property values have been plummeting and have not begun to recover. A drive through both major cities and suburbia tells the story. Vacant stores, empty shopping malls, cancelled mixed use developments and eerily empty car lots presage bad things to come. We have discussed the origins of the housing crash before and the role played by feckless politicians and over-ambitious bankers. Now this crisis has spread to the commercial sector. Banks and commercial lenders saw in the new housing starts an equally promising demand for new shopping malls and suburban offices. Lenders forgot about pre-leasing requirements and made speculative loans on buildings that had no pre-leasing. As with housing, the rule book was thrown out the window. Like the aftermath of any wild party, there is hell to pay in the morning. It is morning in the commercial marketplace and the fat lady is singing. 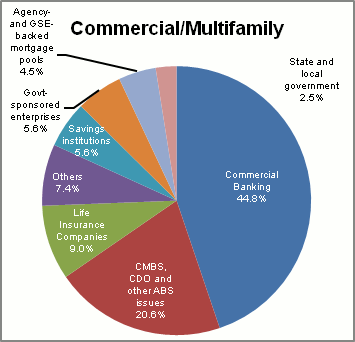 Depository institutions hold about half of the $3.2 trillion of debt on US commercial property. The default rate in the first quarter of 2009 was just 2.25%. Sounds OK until you do the math and realize that $36 billion was in default and it is just beginning. The FDIC puts troubled banks on “the problem list”. In early 2008, there was one bank on the list. At the end of June 2009 there were 416, up from 305 at the end of the first quarter when the default rate was just 2.25%. Total assets at these problem institutions total $299 billion. The problem is that the total reserves of the FDIC are just $42 billion. The FDIC has closed over 100 banks and one good estimate is that they will close around 10% of US banks, 500 to 1,000, before the crisis runs its course. The losses will dwarf the $394 billion of the RTC and may surpass a trillion dollars. Is there any wonder why banks are loathe to make new loans? So what happens to commercial real estate? With prices plummeting, there must be some great buys out there, one must assume. But do not bet on it. This was not just an earthquake. The plates shifted, and like musical chairs, when the music stops there will be fewer chairs and many people left standing. Consolidation is the next step. There will be the inevitable drop in rents and with it property values. 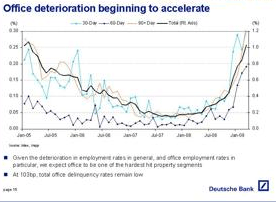 The better and stronger tenants will flee the less attractive Class B and Class C space and move to Class A properties. Class A properties will survive due to full occupancy and stable cash flow. But the lesser properties that were leased will empty. Like the suddenly quiet auto malls with the empty Pontiac, Saturn and Chrysler dealerships, lesser properties will lose their anchor grocery stores, Targets, and big box users. With the anchors gone, and traffic with it, the mom and pop small businesses cannot survive. There is no future for the marginal Class C shopping center. Tenants will flee to better locations and more affordable lease rates. Class A offices will survive. Well located and attractive Class B properties may muddle through at reduced revenues – if they can survive the refinancing maze. But, the poorly located Class C office will remain a “see-through” for years to come. Old, tired, and mostly vacant Class C office buildings line the crumbling freeways of Detroit, Cleveland, Youngstown, and countless smaller rust belt cities where excess capacity has eliminated the need for new development. 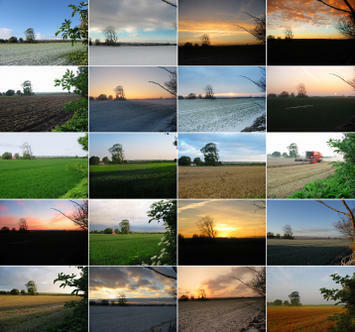 A year from now, the landscape of America will be forever changed. The office and retail markets will be vastly different than they look today. Not much of it will be good. Five years from now, will empty shopping centers and auto dealerships remain shuttered or will they be rebuilt or torn down and their use converted to something more productive? Will our politicians cease their meddling in the market and allow the market to heal itself? These are questions that will haunt our economy for the next decade.